Seems quite a long time since I last updated this – meanwhile the quiet pace of life in the Correze has been disrupted by a flying visit to UK. We have been much luckier (so far) with our weather here than in UK. We have had a bit of snow, but not more than a couple of inches and it has never lasted for more than a couple of days. The temperature here seems to go all over the place, 2 one day, 15 the next. Although the roads haven’t been too bad, we have not been going out too much. A couple of exceptions were when Judy went to Church in the Dordogne, and we met a couple of friends for lunch afterwards, and a Christmas lunch given by the local branch of the Franco British Chamber of Commerce. This was held in a small hotel run by an English couple near Tulle, a large town about 30 miles away. The roads were a bit icy, and it was quite foggy, but we made it OK and lunch was very nice. What they hadn’t mentioned was that the hotel is at the top of a hill, and after last year’s event a number of guests couldn’t actually get away through the snow and ice they had then, and had to stay the night! Tulle is actually the departmental capital, despite being much smaller than Brive. It’s not a very attractive town, but most people dislike it for the simple reason that it’s where you have to go to pay your taxes! 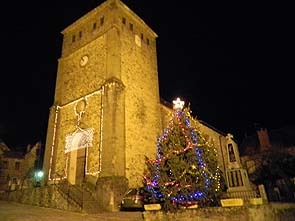 Voutezac takes Christmas quite seriously - the council put up some very nice decorations. We made our final preparations for the holidays – most of the presents were from Amazon and went via Rachel – thank you. We have found a good boarding kennel for Bertie, so were able to drop him off on the way to Brive Airport. We flew to London City Airport on Christmas Eve with City Jet. After all our worries about the weather we were only an hour late landing in London. The airline service is very good – helped by the fact that there were only 13 passengers on the flight! We hired a small car and set off to stay with Rachel in Tooting. I have to say that Judy and I are now very much country mice. Although we have both lived in London, we now find the noise and bustle hard work! But it was worth it to see the family. Christmas day was spent with Nick, Lisa, Jake, Esme and Rachel at Nick’s in Essex – a really good traditional day right down to the totally unfounded accusations of cheating at the board games. Boxing Day was at Martin’s (my brother) – again a really nice family occasion. On the 27th we had a really nice pub lunch in Richmond, and in the afternoon Rachel took us to watch Harlequins v London Irish at Twickenham, along with, we soon discovered, 74,000 other keen spectators. Although the game wasn’t very good we had a great time. The next day we met Nick and family again at Bluewater – the huge shopping mall in North Kent. Perhaps not the grumpy old man’s ideal day out, but it was really nice to see everyone again. Our busy schedule continued with a visit to Priscilla and William Hedley, Judy’s friend from her nursing days at GOS, who had organised the reunion Judy went to in September. We had a very enjoyable lunch there, with Judy catching up on a number of her old friends. They live in East Greenwich, and, apparently, you don’t actually have to go through the Blackwall Tunnel twice to get to West Greenwich as we did. Whoops. On the 30th we went with Rachel to Stevenage to see Judy’s family at her sister Carol’s house. Her other sister Gill was also there with her husband Phil, and her brother Chris. Sadly Peter, Carol’s husband, is really not well, and was not able to join in as much as I am sure he would have wanted. The girls all went to see Judy’s mum in her home – sadly she really didn’t recognise them. We had a very pleasant lunch and caught up on some of the family gossip and swapped presents. Gill seemed to do best. In the evening we took Rachel to a French restaurant in Clapham (no I’m not sure why either), and we had a nice meal and picked up a £60 parking ticket. London just loves tourists doesn’t it? Next day we stopped off at Canary Wharf on the way to the airport and had breakfast with Rachel, saw where she works, and met her boss. He didn’t seem to blame us at all, which was nice. We got back to Brive right on schedule, and when we eventually found the car park ticket, we picked up a very happy Bertie and arrived home. We saw in the New Year with a call from the kids in UK, and a glass of wine. Since then the weather has been cold and a bit wet, and we have both got stonking colds which we blame on England. Thanks to everyone who made it such a good Christmas !